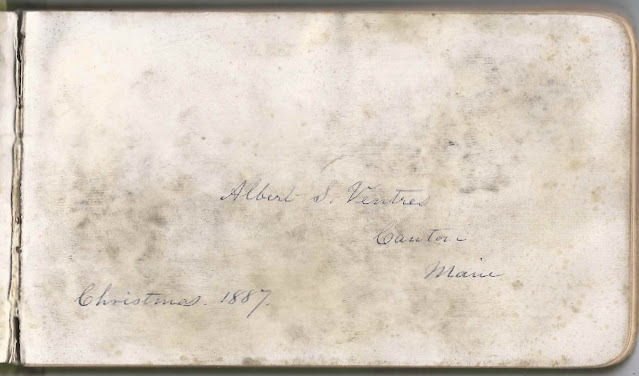 Late 1880s autograph album of Albert Smith Ventres of Canton, Maine, compiled while he was a student at Hebron Academy at Hebron, Maine, in the Class of 1888. It appears that the album was a Christmas present in 1887. The album is approximately 7" x 4-1/4" and contains the sentiments of 85 of Albert's relatives, friends and classmates. An alphabetical list of the signers appears at the end of this post. 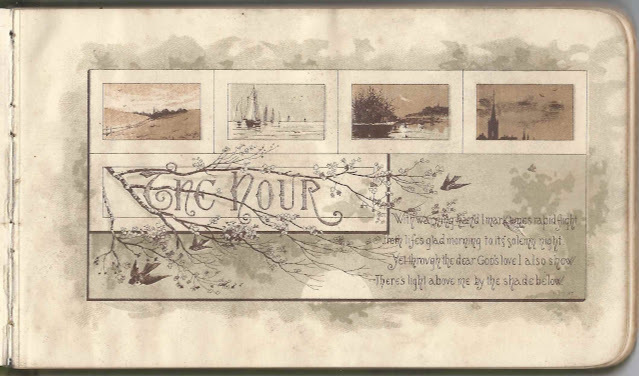 The album is interspersed with nine illustrated pages. Albert Smith Ventres was born 12 September 1868 at Hyde Park, Massachusetts, the son of Rev. William Hosmer Shailer Ventres and Eliza (Murdock) Ventres, who were born at Haddam, Connecticut, and Brookline, Massachusetts, respectively. The family was living at Canton, Maine, in the late 1880s, as Rev. Ventres was a minister there. Rev. Ventres' obituary appeared in the Harvard Graduates' Magazine, Volume 21, 1912/1913. Click on the image to enlarge it. Both of Albert's parents signed pages in his album, Rev. Ventres on January 29, 1888, and his wife on January 30, 1887. Four of Albert's siblings signed pages in his album. 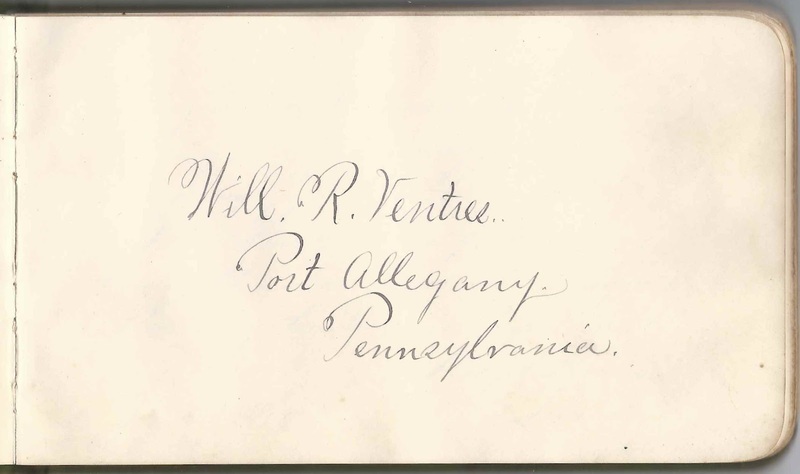 William Robinson Ventres and his wife Martha Ellen (Goding) Ventres, "Mattie", of Port Allegany, Pennsylvania, signed facing pages. Mattie dated hers November 25, 1888. 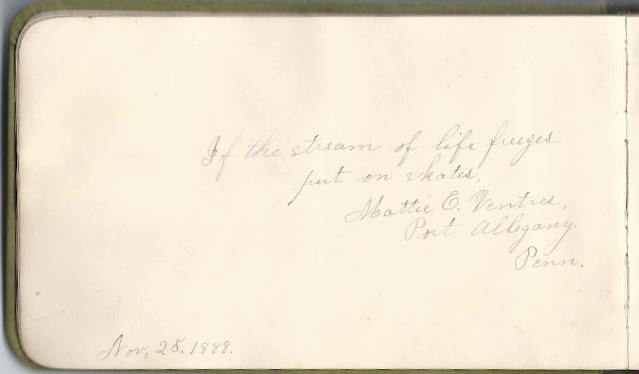 Albert's brother Jonah Warren Ventres of Peru, Maine, signed a page on January 28, 1888. 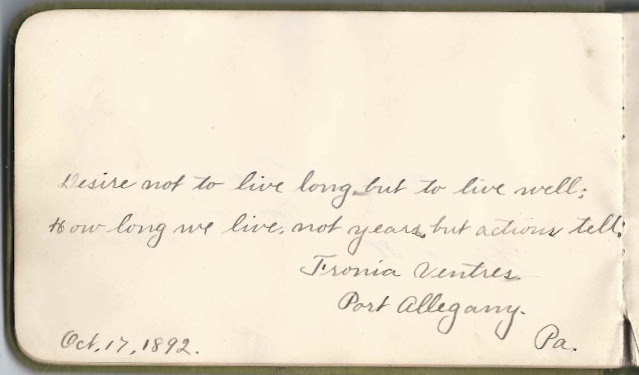 His wife Sophronia Lany (Boynton) Ventres, "Fronia", signed a page at Port Allegany, Pennsylvania, on October 17, 1892. 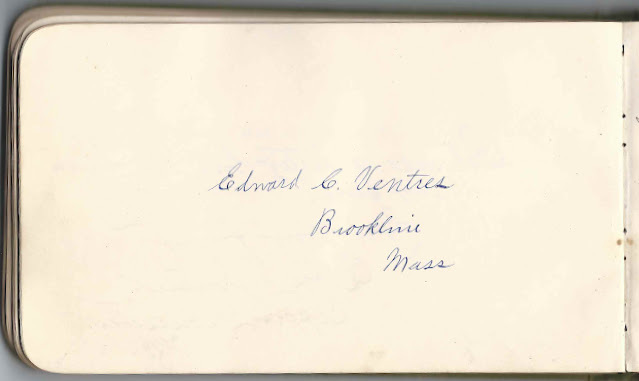 Albert's brother Edward Chase Ventres of Brookline, Massachusetts, signed a page. Albert's sister, Mary Eliza (Ventres) Goding of Port Allegany, Pennsylvania, signed a page on January 2, 1889. As noted above, many of the signers were students at Hebron Academy, mainly from the Classes of 1887 and 1888. Refer to the list below. See a commencement program from 1887 here. On 8 October 1903, Albert Smith Ventres married Lucy Fuller Harding, "Lou", daughter of Captain Robert Libby Harding and Elizabeth Orr (Davis) Harding, who were born at Wellfleet, Massachusetts, and Topsham or Brunswick, Maine, respectively. Lou was born 27 February 1864 at Wellfleet, Massachusetts. According to the Census of 1910 of Portland, Maine, Albert was by then divorced and was working as the bookkeeper at a wholesale grocery. By 1920, Albert had moved to Corinth, Maine, was living alone and not working. Interestingly, his parents had moved to Corinth for Rev. Ventres' last ministerial post. Albert's mother died in 1900; his father married Marietta (Herrick) Eldon in 1905. Rev. Ventres died in 1912. Perhaps Albert had inherited their home at Corinth. I lost track of him after 1920, though I assume he was the Albert S. Ventres mentioned as the owner in 1924 of this summer home on Peaks Island. In fact, there's an archive of Ventres papers relating to Peaks Island. C. L. Buck of Snow's Falls, Maine, signed at Hebron Academy on September 19, 1887. Presumably Charles L. Buck. Snow's Falls is on the Little Androscoggin River between South Paris and West Paris. Luella B. Clark of South Berwick, Maine, signed on November 8, 1889. 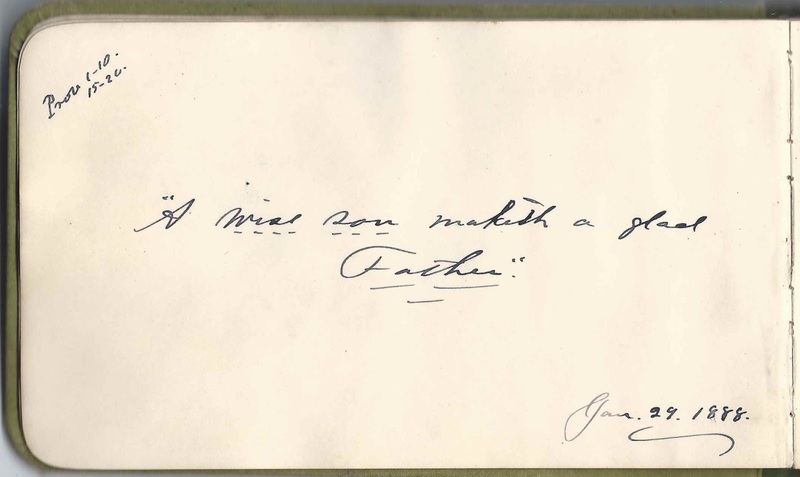 Frank J. Clark also signed the page. 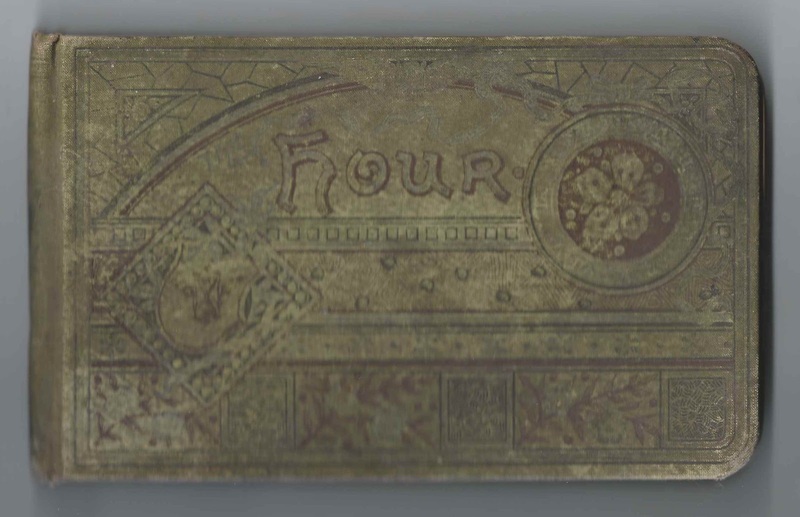 Alpheus Hanscom of Lebanon, Maine, signed on January 1, 1889; "G. G. O. M."
Edward A. Hodge of Amesbury, Massachusetts, signed on January 3, 1891. "A.D.C." S. Ethel Hodge of Amesbury, Massachusetts, signed on December 28, 1890 "A.D.C." 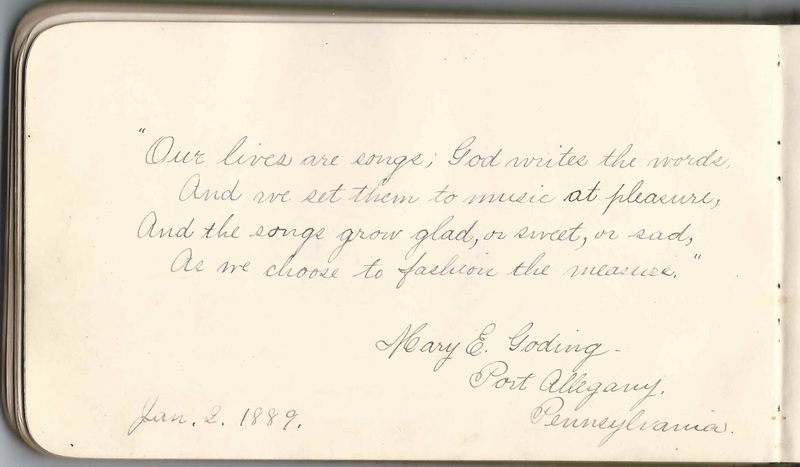 Mary E. Jordan of Promised Land, Maine, signed on April 22, 1887. Promised Land was a village in Poland, Maine. W. E. Lombard or H. E. Lombard of Turner, Maine; not positive of first initial. There was a Willie E. Lombard at Turner, Maine, about the same age as Albert. 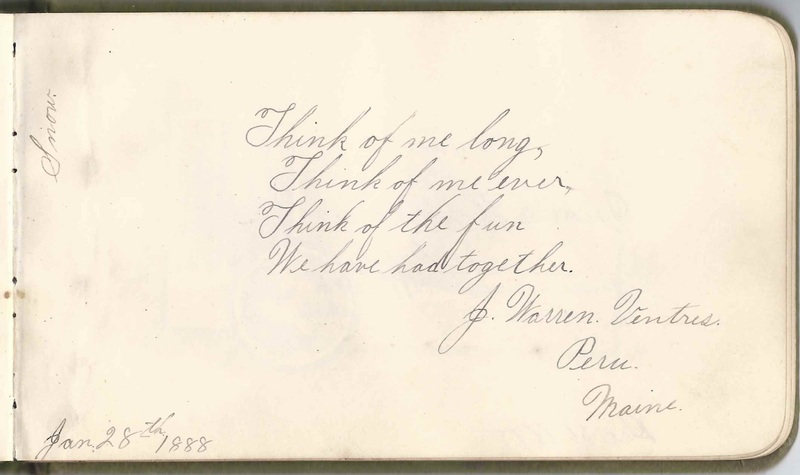 P. E. Lowell of Buckfield, Maine, signed on April 22, 1887. Class of 1887 at Hebron Academy. Percival Ellsworth Lowell. James E. Moody of Turner, Maine, signed on June 22, 1888; "an 88er"
G. H. Newman, signed at Dixfield, Maine, on October 14, 1888. Presumably George Henry Newman, husband of Josephine Malvina (White) Newman, who signed the right facing page. Josie M. Newman, signed at Dixfield, Maine, on October 14, 1888. Josephine Malvina (White) Newman, whose husband George Henry Newman signed the left facing page. 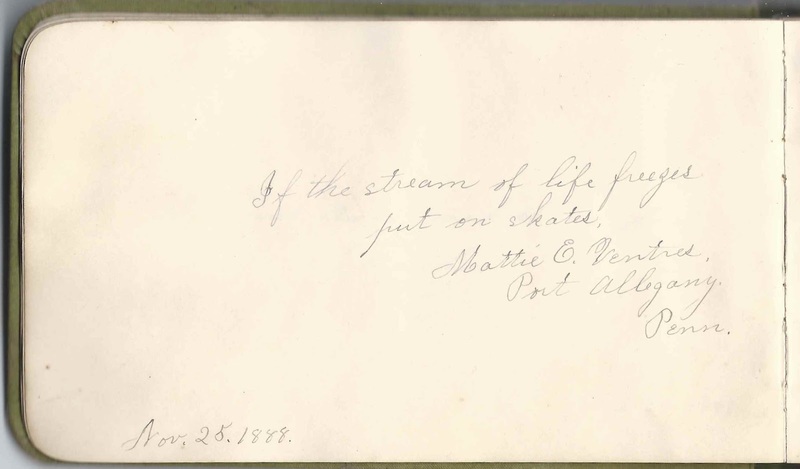 Albert A. Richmond of North Paris, Maine, signed at Hebron Academy on "1-6-1887". He signed the page upside down. Father, signed on January 29, 1888. He was William Hosmer Shailer Ventres, a minister, sawmill owner. Read more about him here: http://phys.org/news/2014-01-evidence-nordic-grog-scandinavia.html [The Harvard Graduates' Magazine, Volume 21, 1912/1913]. From The History of Peru, in the County of Oxford in the State of Maine, from 1789 to 1911: Rev. Mr. Ventres and sons ran the sawmill a few weeks to accommodate a few customers. He could do most any kind of work well. He was a good brick mason, and was not above work; was always busy out of the pulpit. He contributed much labor in painting and reshingling the old meeting-house during his pastorate here with the Baptist church, three years or more. Mattie E. Ventres of Port Allegany, Pennsylvania, signed on November 25, 1888. 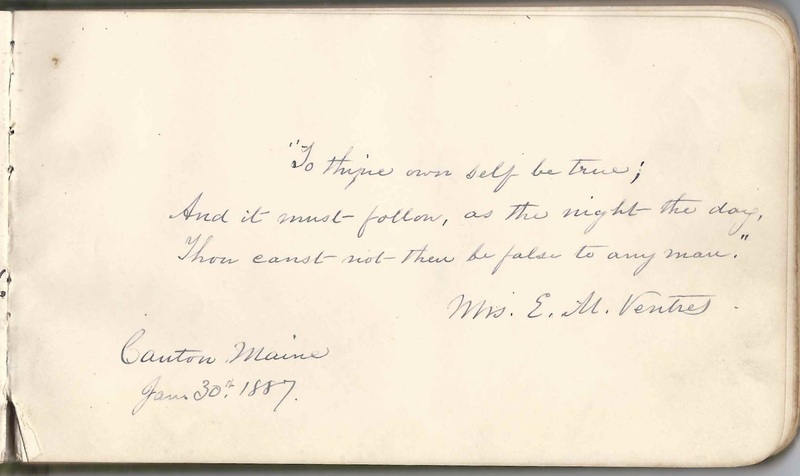 She was Martha Ellen (Goding) Ventres, wife of Albert's older brother William Richardson Ventres, who signed the right facing page. Will R. Ventres of Port Allegany, Pennsylvania. He was William Richardson Ventres, Albert's older brother. 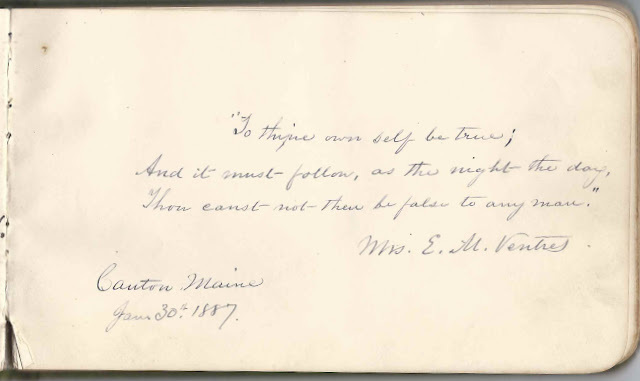 Will's wife, Martha Ellen (Goding) Ventres, signed the left facing page. Fronia Ventres of Port Allegany, Pennsylvania, signed on October 17, 1892. She was Sophronia Lany (Boynton) Ventres, wife of Albert's older brother Jonah Warren Ventres. 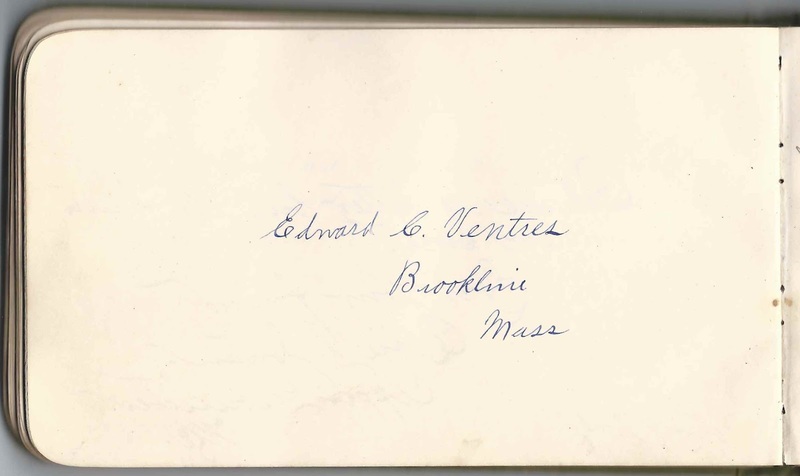 Mrs. E. M. Ventres, signed at Canton, Maine, on January 30, 1887; presumably Eliza (Murdock) Ventres, Albert's mother. 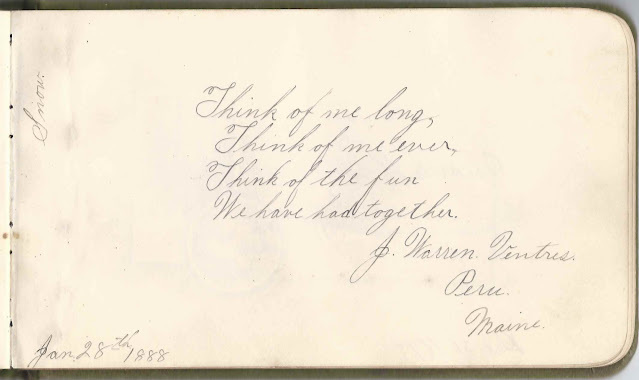 J. Warren Ventres of Peru, Maine, signed on January 28, 1888. He was Jonah Warren Ventres, Albert's older brother.